Set in some of Florida’s finest countryside within easy reach of the major theme parks, Mucky Ducks are self-drive amphibious vehicles seating up to 4 people – making them perfect for families and groups. Drive around 240 acres of woodlands, sand trails and of course splash in to lakes and swamp areas. 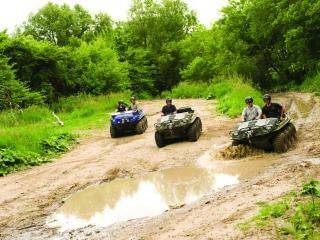 The entire experience will take around one and a quarter hours, beginning with a safety briefing in the specially designed training areas to ensure that you have the technique of driving one of these machines under your belt before you launch on to the trails on your own. You will be accompanied throughout by an expert guide in their own vehicle who will ensure you get the most out of your experience and do not miss any of the local wildlife along the way. Start Times: There are 4 start times to choose from: 9.00am, 10.30am, 12.00pm, 1.30pm or 3.00pm. Includes: Mucky Duck driving experience, safety and instruction briefing, all safety equipment including helmets and life vests, expert instructor. Duration: Total experience is about 90 minutes. Location: Kissimmee, just off route 27 at the end of the SR-192. The location is a 20-25 minute drive from Walt Disney World. You must be over 18 to drive a Mucky Duck but passengers can be 4 years old and over. This is a family friendly environment but children must be able to sit unaided.